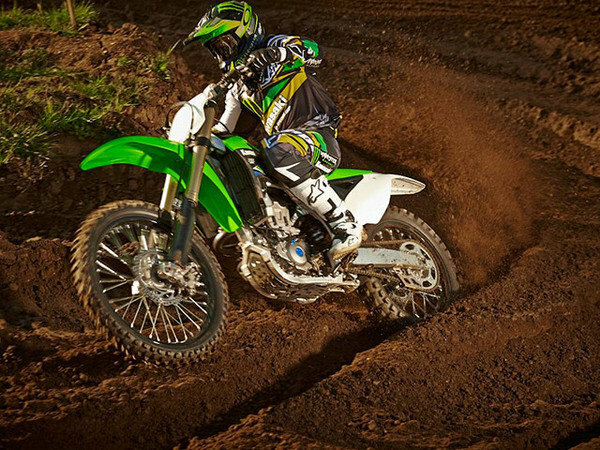 It’s no wonder that Kawasaki’s KX™450F has amassed an enviable championship record in AMA Supercross and AMA Motocross. Having a great rider definitely helps, and Monster Energy® Kawasaki’s Ryan Villopoto’s credentials are impeccable, including double-up titles in AMA Supercross and Motocross titles in 2011, followed by another AMA Supercross title in 2012. And in 2013, Villopoto made it three straight Supercross championships in a row, becoming the first rider to win back-to-back-to-back AMA Supercross titles since the great Ricky Carmichael, another rider whose career blossomed aboard Team Green™ machines. A common denominator in these performances is the machinery, and the KX450F consistently delivers the most sophisticated technology with the highest degree of rider adjustability and the most progressive electronics package ever seen on a production motocross bike. The pattern for Kawasaki’s success is obvious. 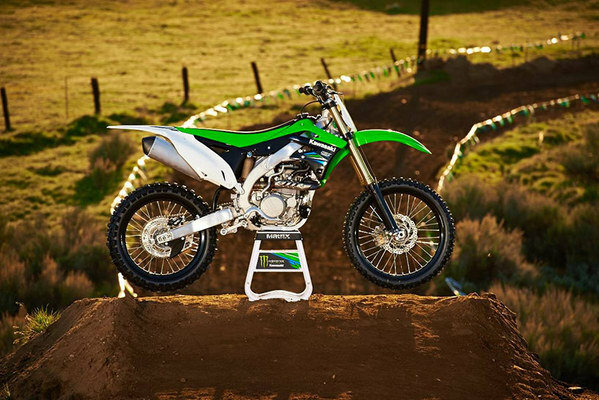 The 2014 KX450F features a 48mm Kayaba Pneumatic Spring Fork (PSF), which uses pressurized air to eliminate the traditional metal-coil fork springs. The reduced weight and inertia of an air spring offers superior smoothness and enhances the fork’s ability to follow terrain contours. The Pneumatic Spring Fork also significantly reduces friction and cuts weight by an amazing 1.7 lbs. per set! Other benefits of the air spring include better bottoming resistance, quicker, easier and more effective tuning using nothing more than the included Kawasaki Genuine PSF Air Fork Pump, and reduced oil contamination due to the lack of microscopic metal particles caused by fork springs rubbing against the inside of the fork tubes. The super-hard Diamond-Like Carbon (DLC) coating on the outer surface of the inner fork tubes and high-tech Kashima Coat treatment on the inner surface of the outer fork tubes significantly reduce drag compared to a standard fork assembly and help deliver supple, fade-free action. Out back, a Kayaba rear shock features a beefy 50mm piston and a top-shelf Kashima Coat surface treatment on the inside walls of the shock body. Ample adjustability helps ensure smooth, reliable and consistent action of the rear suspension that not only offers superior performance, but also helps the rider relax and conserve valuable strength on the way to the finish line. Kawasaki offers an optional rear suspension tie rod that is one millimeter longer than stock, which can be used to reduce seat height by four millimeters. 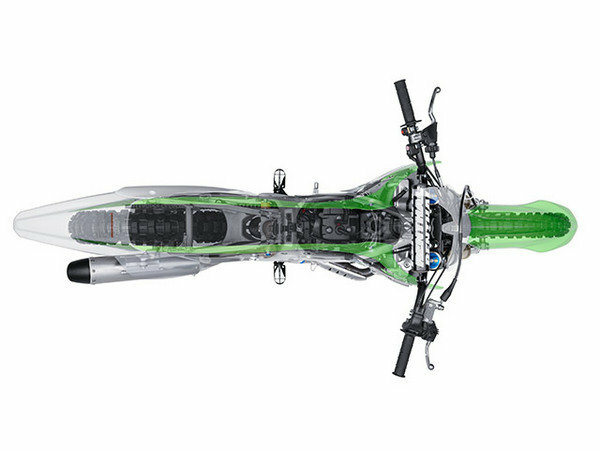 The KX450F’s swingarm complements the shock by incorporating a large front casting, combining forces for maximum strength and rigidity. Enhancing the rider interface in both the ergonomic and engine departments, the KX450F offers a choice of four different handlebar positions, two footpeg positions, and virtually unlimited ignition mapping capabilities with the optional KX FI Calibration Kit. These adjustments make the KX450F uniquely able to adapt to changing track and surface conditions and meet the needs of a wide range of riders. The Digital Fuel injection (DFI®) system comes standard with three pre-programmed ignition maps which are easily changed without the use of a laptop computer or any other electronic devices. Maps can quickly be changed between three settings – standard, hard (terrain) and soft (terrain) – by swapping the DFI wire coupler cap clipped to the side of the steering head. Easy access to the coupler cap means no additional accessories are needed to alternate between pre-preprogrammed maps – simply connect the appropriate coupler cap to immediately activate an ignition mode to match different track conditions. The ECU is also fully re-programmable and custom maps can be created using the accessory Kawasaki Racing Software Calibration Kit, the same tool used by Kawasaki factory and privateer teams in AMA and FIM racing. The KX450F’s engine provides proven top-end and overrev performance, but ups the ante with impressive torque from ultra-low revs all the way through the upper mid-range. The intake valve lift, piston crown and ignition tuning provides a smooth powerband with significant “area under the curve,” aka usable power. The KX450F’s works-style bridge-box bottom piston allows for optimum strength and high rev durability. Narrower grips for 2014 help reduce arm-pump and feature a softer material that makes things easier on the rider’s hands. Minimalist bodywork, shrouds and number plates contribute to the slender feel and sleek looks of Kawasaki’s flagship motocross machine. Sparing no attention to detail, the seams between the radiator shrouds, seat and side covers are very flush fitting, which help prevent snags and allow the rider to change position and maneuver more freely on the bike. The compact fuel tank also forms a smooth and nearly straight line with the seat to allow maximum rider movement. A blue finish on the oil cap and two caps on the generator cover highlight the factory appearance of the KX450F motor, and match the blue anodized finish on the suspension adjusters. An embossed logo on the clutch cover features a trick design and is painted silver to help hide the normal signs of wear. The 2014 KX450F is available in Kawasaki Lime Green, with black anodized rims, blue highlights and aggressive graphics inspired by the Team Monster Energy Kawasaki factory race bikes. 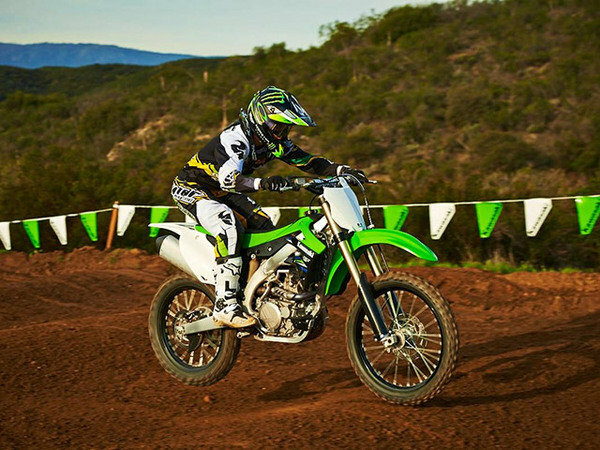 Racers who ride their KX450F at designated events are eligible to receive support from Team Green™, Kawasaki’s amateur racing support program. For over 30 years, Team Green has been providing regional support vehicles and highly trained technicians at more than 100 yearly events throughout the United States, offering technical information and assistance to those who race Kawasaki products. Kawasaki also offers a comprehensive contingency program for amateur and professional riders who place well at designated events.